We are proud to offer you the most reliable and durable lawn & garden care, generators & pumps, snow removal and marine equipment for your home or business. Honda's products run quietly, efficiently and produce low emission levels making them the right choice for environmental responsibility. In fact, all of Honda's engines meet and exceed EPA and CARB emission standards. Not only are Honda products the right choice for the job at hand, they are the right choice for the environment. Eight healthy front lawns have the cooling effect of 70 tons of air conditioning - enough for 16 average homes. Dust and smoke particles from the atmosphere are trapped by turf which helps make the air cleaner. Groundwater is enhanced in two ways by a dense turf. Turfgrasses increase infiltration of water and also clean the water as it passes so that underground water supplies are recharged for use by us all. Fire retardation buffer areas of well maintained lawngrasses around buildings is good insurance. Honda Generators and Water Pumps have earned a reputation throughout the world for being dependable, easy to use and rugged enough to meet the demands of homeowners and commercial users alike. Portable electric power anywhere can enhance most outdoor activities we enjoy. Honda generators have also been a long time favorite of the construction and rental industries for their reliability and durability. The increased demand for electric power often pushes local power providers to capacity and sometimes results in "brown-outs". Honda offers the world's most complete line of portable generators to provide power in situations just like this, and all units meet EPA and CARB emission levels. 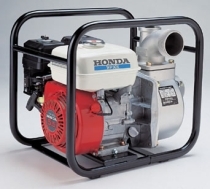 Honda water pumps are known for their durable construction, quality engines and easy portability. These features apply to all categories of pumps that are offered by Honda. Honda general-purpose de-watering pumps are for moving relatively clean water. Construction pumps offer options to meet the tough demands of the jobsite, with high capacity trash pumps or low volume run dry capable diaphragm pumps. Honda's multi-purpose pump can be used to move a variety of chemicals. And Honda's submersible pumps can be used for a variety of residential and commercial sump applications. All of these gasoline-powered pumps are equipped with Honda OHV commercial grade or OHC premium residential engines and meet EPA and CARB emission levels. Honda Snowblowers are designed to perform with strength and precision and without fuss or bother. These legendary, easy starting four stroke engines consistently deliver smooth and reliable power. Every model is designed to operate simply, safely and comfortably. All of the controls are laid out logically and placed to allow a sure and easy grip, even with heavy gloves or mitts. Honda Snowblowers are powerful and well-crafted pieces of quality machinery that are made to last for years. Honda String Trimmers and Stick-Edger offer the same advantages as the rest of Honda's Lawn and Garden products thanks to four stroke engine technology. Honda centrifugal pumps are ideal for use in a wide variety of applications such as agricultural, construction sites, de-watering, sprinkler systems, fire fighting, boating and general home use. Honda's world-renowned easy-starting engines deliver smooth, quiet and reliable four-stroke power and ultra low emissions levels.